Acker & Blacker’s The Thrilling Adventure and Supernatural Suspense Hour is a staged comedy production in the style of an old-time radio show that proves radio is still the king of all media! A sophisticated comedy sprinkled with affectionate homage to 1940’s era radio, the Thrilling Adventure… program features three non-serialized serials in each episode, as well as jingles and messages from sponsors such as Patriot Brand Cigarettes (“Good for your Constitution”). Ben Acker and Ben Blacker write and produce a new show each month and have since March 2005. 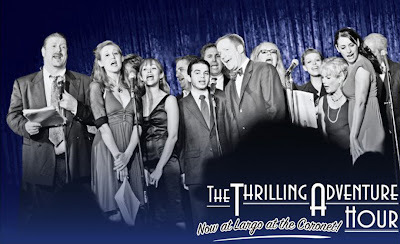 The Thrilling Adventure and Supernatural Suspense Hour is performed by nicely-dressed performers whom you’ll recognize from television, comedy clubs, the UCB and Second City stages, and the movies. Each and every one of them is raring to take down Garrison Keillor’s troupe of yellow-bellied thesps in a rumble, anytime, anywhere.